This week Covectra, a serialization, authentication and track & trace technology services provider, announced the launch of its patented StellaGUARD security label. The label is embedded with stars that are arranged in unique and random patterns and contain a serialized GS1 2D barcode, thus enabling real time authentication and serialized pedigree tracking through the use of a mobile app developed by Covectra. The StellaGUARD label can be applied to virtually any package and material, was developed by Covectra in anticipation of the EU’s 2019 Falsified Medicines Directive requirement for tamper evident seals on all pharma and OTC primary packages. The security label is integrated with Covectra’s EPCIS Certified AuthentiTrack database, which now is managing over 2 billion serial numbers. This enables the StellaGUARD label to be used not just for rapid authentication, but also for diversion detection and isolation as well. “Our new, patented StellaGUARD solution offers two layers of protection, leveraging the benefits of a barcode and connecting it with an image of a random pattern of “stars” embedded in a label, providing instantaneous authentication and copy-detect protection,” stated Covectra President, Steve Wood. “Since barcodes can be easily copied, this new solution makes counterfeiting virtually impossible – which is especially critical when it comes to the pharmaceutical industry when counterfeit goods can be life threatening,” he added. Covectra will be exhibiting the StellaGUARD security label along with its new ATLAS L1/L2/L3 site/line serialization system at this year’s Interphex in New York City from March 21-23. Covectra can be found at Booth #1728. If you have additional questions or would like to line up an appointment to speak with one of our brand protection experts, please contact us at 508-621-7327. 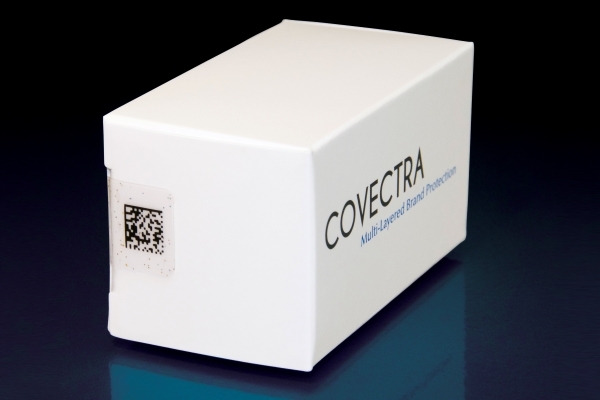 Headquartered in Westborough, Massachusetts, Covectra offers multi-layered brand integrity and protection solutions, including its serialization-based AuthentiTrack technology, which includes serial number generation, event repository and event repository management; packaging line serialization, and front-end software applications such as ControlTrack to utilize serial numbers for a variety of business benefits, including counterfeit detection, adherence, and returns verification.